You probably have heard of this technical analysis which shows you patterns and gives you indicators to predict the next price move in a security. If you have heard of this, I am sure you asked yourself (like most people): does technical analysis really work. I will try to help you answer this question, elaborate what it is and how it should be used. Therefore, followers of technical analysis believe that in stock prices certain patterns are developed and trends are formed. These patterns (after the first statement) then tend to repeat themselves. So basically it is all about spotting this pattern/trend and hopping into it at the right moment. To help identify these patterns specific charts were created. Due to the third statement followers of technical analysis often solely rely on these charts and act from charts only. This statement tells that the current price of any security discounts everything (news, companies performance etc.) and is, therefore ‘correct’. Followers of technical analysis often use many different kinds of charts and draw special signal-lines on them. This process is called charting. Here I will cover some of the basics of technical analysis. Let’s start with Trends. There are three possible forms of trends: an uptrend, a downtrend and a sideways trend/no trend. An uptrend is rising prices and is characterized by higher highs and higher lows. The opposite is the case for a downtrend (lower lows, lower highs). No trend or a sideways trend is where there is uncertainty in the market and therefore no real and clear directional moves. 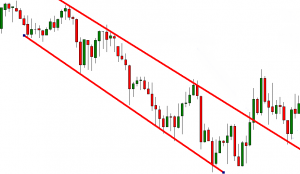 A very important instrument in technical analysis are support and resistance lines. These normally make trends and other patterns much better visible. 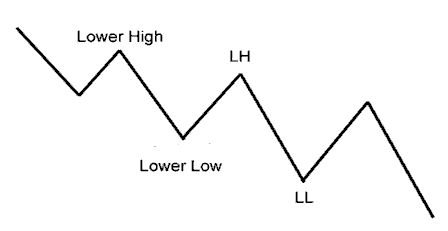 The support line is created by connecting the lows and the resistance line is created by connecting the highs of a trend. Support and resistance lines normally show areas which are hard for the price to get through. A breakthrough through one of these lines often counts as a signal for trend reversals. The two lines create a channel. This channel can have many different forms depending on the support/resistance lines. One of the more common used charts (mostly by beginners) is the line chart. This probably is the most well-known and basic form of chart, nothing fancy here. The chart is created by connecting all the closing prices for a given security over a certain period of time. This is also the chart where there is the least given information. This chart often is used to give a cleaner and less distracting view of the price movement. The next chart is probably the most used chart for more-advanced traders. 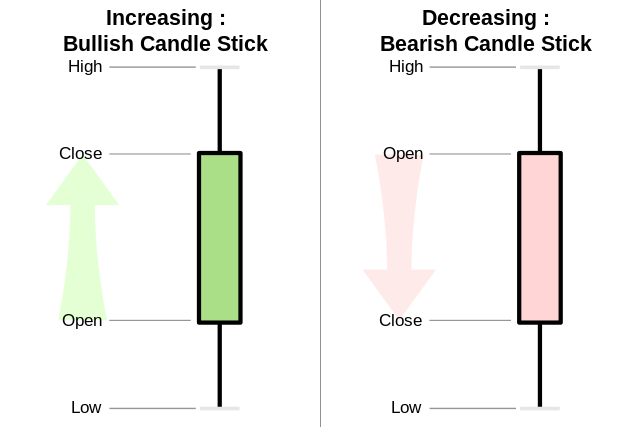 The candlestick chart. This chart offers a little more insight into trading activity than the line chart. The green candlesticks represent an up day, where the price closed higher than it opened. The red ones indicate a down day. The thin black line indicates the high and the low of a certain amount of time. The thicker red/green parts show the open and the close of a certain time. 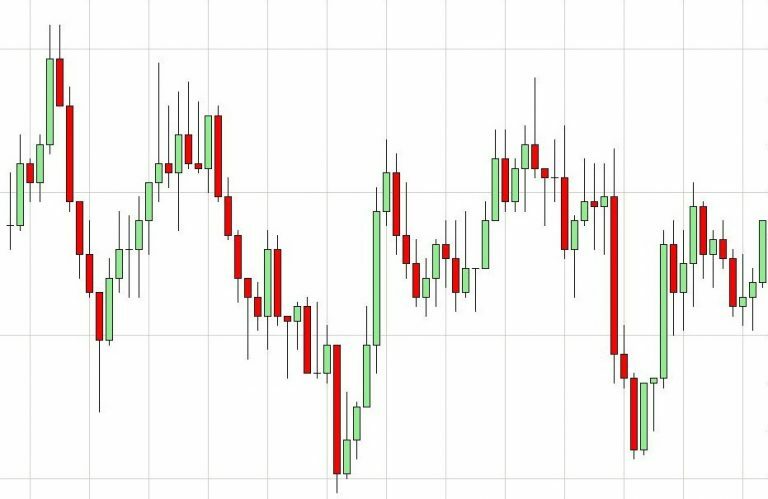 Usually, one candlestick indicates a day of trading. These are the two most widely used charts which in my opinion really offer enough information for a single chart. Indicators are supposed to indicate trend reversals or trend continuations. Some indicators are placed on the actual price chart itself and some have their own separate box for themselves. There are countless different indicators. It would be impossible for me to even list half of them. Therefore, I will try to list some of the most common and most used ones here. 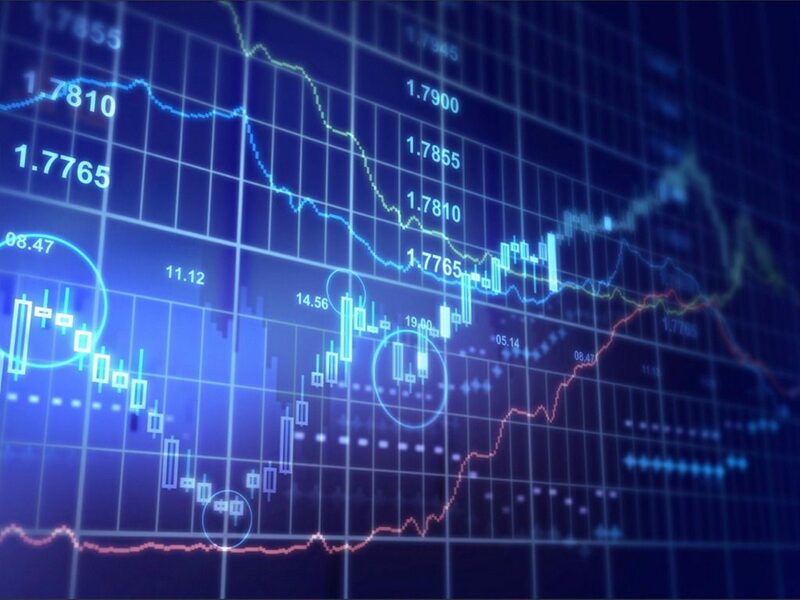 Moving averages are smoothed out versions of the price charts themselves. They are normally placed on the price chart itself. As for every indicator, there are many different variations of this indicator. Regarding the time frame of the average prices, the most used settings (for longer-term investors) are the 200 day/100 day and 50 day moving average. Many people even use two different types of time settings to try to find up-building momentum. Otherwise, there are two different types of moving averages. 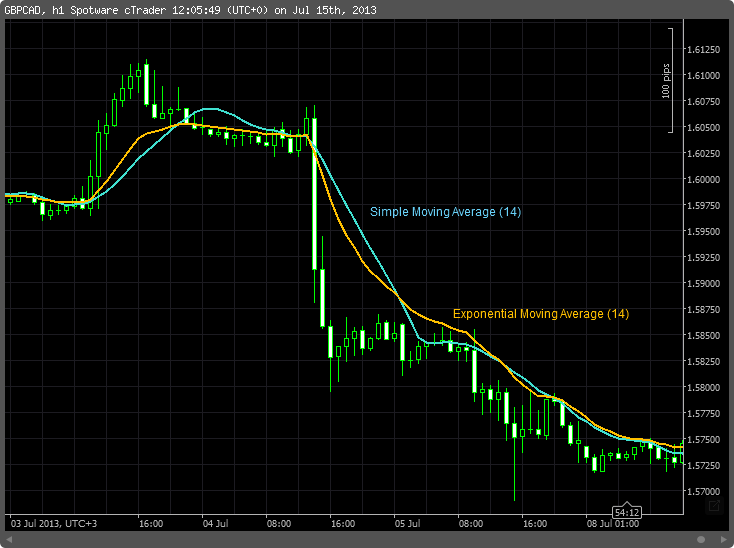 There is the simple moving average (sma) and the exponential moving average (ema). The ema is an exponential moving (stretched) version of the sma. The sma is more commonly used, but many investors use both of them at the same time. A crossover of two moving averages can sometimes be a signal for a trend reversal. If you ever read about indicators, you probably heard of this one. The MACD is one of the most well-known and most used indicators. This indicator is a momentum and trend-following indicator. It consists of two lines which both are special kinds of moving averages. The shorter moving average is called the signal line which should be used as a trigger for buy and sell signals. Different line-ups of the two lines are supposed to show overbought and oversold conditions of a security. RSI is an indicator which is set up between 0 and 100. With default settings, there are straight lines at 30 and at 70. These indicate the overbought and oversold areas. An RSI above 70 signals overbought conditions and a RSI under 30 indicates oversold conditions. The line in the middle is sometimes used as a buy/sell signal line. I think technical analysis can be great and helpful for many traders. But I think there are some problems with it as well. For the first part, I think some areas of technical analysis are just completely subjective, for instance, patterns. There are so many different weird formations in stock charts, but there seldom is a perfect pattern. Therefore, you have to interpret some of these patterns and these interpretations are completely subjective. The patterns which you see often aren’t the same patterns which I or someone else can identify. The same counts for support and resistance lines. You can draw them however you want. On most charts, there are at least three different ways to draw these lines. Another problem with technical analysis is that too many people, especially beginners focus too much on it. It doesn’t help to look at 20 different indicators, patterns etc. This just confuses people because there will never be a scenario where all indicators and patterns will be in indicating the same. So should you use Technical Analysis? If yes how should you use it? Even though I’m not the greatest fan of technical analysis, it is a good tool to help you on decisions. But it really shouldn’t be more. You should never solely rely on any indicator and make a trade purely because of a signal of some kind. If you want to use technical analysis for your trading, I would suggest choosing max 4 indicators to help you make a directional decision. You should use them in conjunction with each other, so the majority of them should point in the same direction. If you are interested in charting and technical analysis you can try out TradingView. Tradingview is a very good charting platform. Check out my review here. Thanks for sharing about technical analysis. I have been into trading before and the main problem I faced was about overcoming my own emotions. Despite I know that a trade was going against me, I ignored all rational and took on the ‘gambler’ approach. 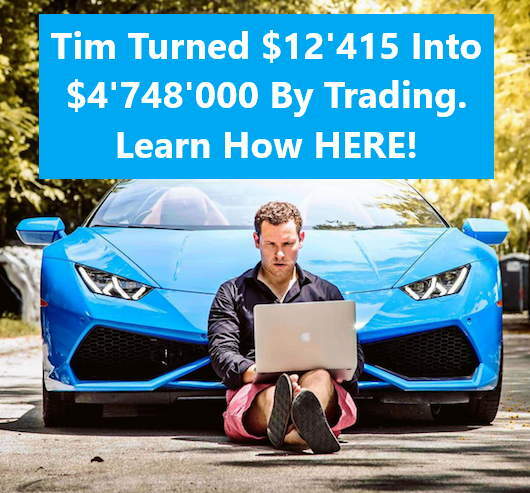 Trading can be profitable and are adopted by people to earn a full time income. However managing emotions and expectations can be a difficult process to master. Hey Leo, you are right! Not letting emotions influence any decisions while trading is extremely important. Great post. This is a very clear explanation of technical analysis and how to use it. I specifically like your insight on patterns. The point you made about pattern formations being subjective is 100% correct. I feel as though some traders will look at a chart for so long and see a pattern that does not exist. If you cannot see a pattern instantly when looking at a chart, then it doesn’t exist. And you are also correct about looking at a bunch of different indicators, doesn’t help. Pick a couple of indicators only and use those for your trading. What specific indicators are your favorite? Thanks for your comment. Seems like you really understand what I am talking about. As I said in the end I don’t really use technical analysis in trading. But the seldom times when I do I try to look at indicators like RSI and Ultimate Oscillator sometimes some others. I’m developing a fully automated robot trading software, that trades all the best opportunities from the stocks Dax market. At this stage I am building the knowledge base based on facts and rules. I am a programmer who knows nothing about trading, but with the help of experts, I am building my knowledge base. Experts say to use moving averages to improve performance. My period of analysis is 17 years, I need to cover several cycles. I work with 25 tickers from Dax, a liquid market with low commissions. Experts say the optimal ratio of wins to losses shoulde be 2:1 ! My time stop is 7 days ! Experts say not risk per transaction more than 2% of total capital ! 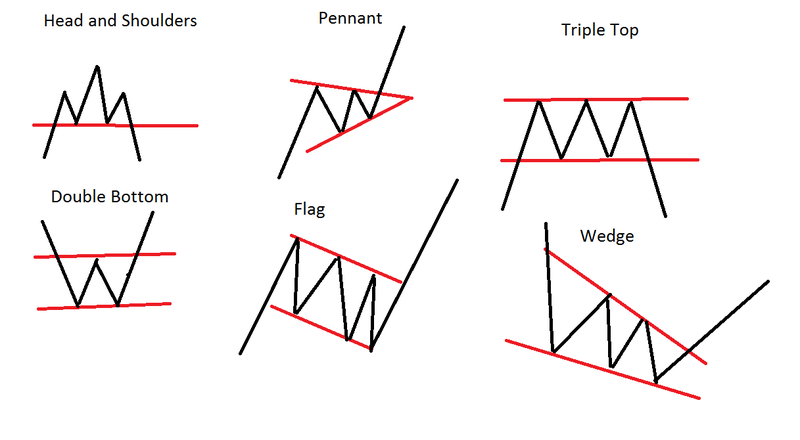 I found 425 Bullish Flag patterns in 17 years, for 25 tickers (*2) ! Experts say that 30 trades is a minimum to suggest statistical significance ! First result: if I trade 35 times a year, I get an average year profit of 37.82% (*3), deducting commissions from the broker! (*1) Is this a profitable strategy ? Do you work with another strategy more profitable ? This is profitable but you work with another pattern ? (*2) Is this value statistically significant ? (*3) Taking into account the results of professional trader, is this first result a low, medium ou high value ? I have practically zero experience with algorithmic trading and thus I can’t really compare your strategy to others. But almost 38% per year isn’t a bad average rerun at all. But just like with all strategies, you don’t know if the strategy will still be profitable in the future. If I were you, you should not only look at the average win, win/loss ratio… but also look at the biggest loss, the performance during financial crisis (e.g. 208) and more. We had an incredible bull market in the past few years which could have influenced your returns significantly, so compare the stats from then to past times, where the overall market wasn’t that stable. But again, I have barely any experience with this kind of trading, so I can’t really help you too much.